A corporation is an independent legal and tax entity owned by shareholders. The owners of a corporation are generally not held personally liable for the actions of the corporation. Corporations are similar to limited liability companies in the protection they provide to an owner’s personal assets. They are different in the way they are taxed. A corporation pays taxes on the company’s profits and the owners of the corporation only pay income taxes on money drawn from the corporation such as salary, dividends, or bonuses. A corporation also has the option of going ‘public’ and selling shares of ownership through public stock offerings. 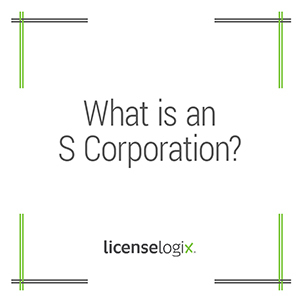 An S Corporation is different from a C Corporation (the default corporation type) because corporate income, losses, deductions, and credits are passed through to shareholders for tax purpose. The shareholders of S Corporations report the income and losses of the corporation on their personal tax returns. The taxes are assessed at each individual’s income tax rate. This allows S Corporations to avoid double taxation on the corporate income. In order to qualify as an S corporation, the corporation must be a domestic (US) corporation, not have more than 100 shareholders, and have only one class of stock. Some types of corporations are ineligible such as financial institutions, insurance companies, and domestic international sales corporations. See the IRS website for more information. In order to elect to become an S Corporation, a corporation must file forms with the federal government and in each state that they operate in. LicenseLogix will prepare and file all registrations for your business, minimizing time-consuming and costly delays. For additional help you can fill in the form on the right or give us a call at (800) 292-0909.